While we're going through the slow process of editing BLUE REMEMBERED EARTH, I've begun to make tentative inroads into the second novel of the trilogy. I have a title, but I'm not telling the world yet - I may well change my mind. IF BRE deals with the colonisation and exploration of the solar system over the next 150 years - along with some snapshots of life on Earth, in a peaceful, prosperous post-climate change future - then the second book leaps ahead several hundred years, into the middle of a centuries-long interstellar expedition to an extrasolar planet, a little of which we already learn about in BRE. Not to give too much away, but it's a kind of generation ship story - except there are lots of generation ships, launched over many years, forming an entire spacefaring community stretched across many light years - a bit like the flotilla in CHASM CITY, scaled up a thousand times. The Akinya family, who feature in BRE, show up again in the new book, although there are not really any overlapping characters. I've often been asked about my working methods, and I've usually answered that I don't do a great deal of pre-planning, preferring to hew out a first draft through blood, sweat and toil. This time, though, I'm taking exactly the opposite approach, blocking out the book on a chapter by chapter basis before I write a word of prose. It may all end in tears, but I'm interested in shaking up my processes every now and then, and I think this will be a good experiment to try. I've tried the elaborate planning thing twice before, with REDEMPTION ARK and THE PREFECT, but in both cases I don't think I got the plot sufficiently well nailed down before diving into the writing. This time I'm determined to resist the temptation. We'll see how it goes. There's been much talk recently about the invisibility of women in SF, for excellent reason. In the Guardian's reader poll of favorite SF writers, for instance, only 4% (edit - apparently it's more like 12 %, not that that's much better) of the 500 plus books mentioned are by women. Polls like that are a waste of time under the best of circumstances but the disparity does serve to highlight the problem. Anyone with an eye on the SF blogosphere is probably more than up to speed on the surrounding debate, but this post by Cheryl Morgan is a good entry point into the discussion. Let's be honest - it's not too bad a time to be a white male SF author. I make a living from my books, I've been the recipient of a well publicized multi-book deal, and there are a good number of other British SF writers who are able to sustain a career solely on the basis of their writing. Many of these writers, such as myself, Steve Baxter, Peter Hamilton, John Meaney, Paul McAuley, Eric Brown, Keith Brooke and so on, are well into our second decade of full-time authorship. There are also many writers who are sustaining careers while also holding down "proper" jobs, either by choice or necessity - excellent, inventive writers like Tony Ballantine, Chris Beckett and so on. Yet, astonishingly, in the UK there is currently only one British female science fiction writer - Jaine Fenn (who happens to be a friend) - with a contract. This is not a happy state of affairs. It would be a dismal state of affairs even if women hadn't already made a vital contribution to the evolution of the form. Irrespective of the importance of women to the field in the past, though, there's little or no possibility of their having any effect in the future - at least in Britain. Things are reportedly a bit better elsewhere. In a recent piece I wrote for a forthcoming academic book on SF, I was at least able to mention a couple of contemporary American female SF writers doing something like space opera. Not many, though. VAST was published in 1998; I read it in 1999. I can safely say that it is one of the very novels that has literally haunted my dreams, in that the book exerted such a powerful hold on my waking imagination that come nighttime I found my sleeping brain racing ahead with the story. It's awesome! On a personal note, I emailed Linda Nagata expressing my enthusiasm for the book and she was kind and generous enough to send me a couple of her earlier paperbacks. 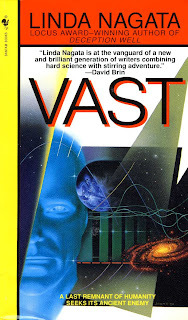 Although it hadn't been any kind of obstacle to my reading, I was then intrigued to see that VAST was in fact part of a future history she had already been mapping through earlier books. I must emphasize, though, that VAST works enormously well on its own terms. My own copy is still boxed away somewhere following a house move, or I would re-read it now, but I'd certainly recommend it to anyone in the mood for some head-spinning far future Einsteinian SF in the same general direction as Greg Egan's Diaspora or Greg Bear's Anvil of the Stars. It's very much it's own thing, though, and fully deserving of a wider audience than it gained at the time of publication. In other news... I've been interviewed by From Bar to Bar! If you've not read one of these quasi-fictionalised interviews before, prepare to be weirded out. Many thanks to Tibor for having me, and I hope my answers are of interest. I love the way woodpeckers come pre-installed with Woodpecker 1.0. 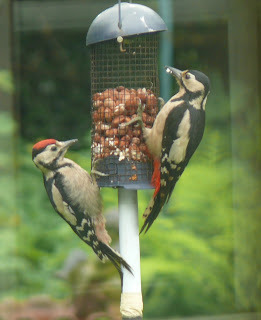 The bird on the left, with the prominent red cap, is a juvenile, the one on the right an adult female. I shot this picture this morning through two windows (the living room and the conservatory) so it's not the sharpest of images, but it's so rare to see two great spotted woodpeckers on the same feeder that I'm happy with any shot at all. I've been enthralled by these fascinating, intelligent and colourful creatures since I was a child. It's remarkable how they've gone from being a relatively uncommon sight (outside of woodland) to a typical garden bird in only a generation or so. I still never tire of them. I should have mentioned this sooner, but I'll be guest of honour (along with Dan Abnett) at Alt Fiction, taking place in Derby on the weekend of 25th - 26th June. In addition we'll be joined by speakers Tony Ballantyne, Cathy Brett, Keith Brooke, Mark Chadbourn, Stephen Deas, Paul Finch, John Jarrold, Juliet McKenna, Mark Morris, Adam Nevill, Mark Charan Newton, Sarah Pinborough, Robert Shearman, Adrian Tchaikovsky, Conrad Williams, Chris Wooding and many more. A program of events is available here. The good people behind the Cardiff TEDx event have now edited and uploaded videos of the day's talks - you can access them from the main TEDx website at http://tedxcardiff.co.uk/ or hop directly to YouTube. In other news, Ian Whates has kindly agreed to take a new 7000 word story of mine, "For the Ages", to appear in SOLARIS RISING, a new original anthology which I would imagine will appear in 2012. My story was inspired by this Scientific American article on The End of Cosmology (unfortunately behind paywall) which appeared in the March 2008 issue. Getting cosmology into SF is hard work, for me, at least, so I was delighted when I found a way into this story. In other other news, I'm pleased to report that "Troika" is a finalist for the Theodore Sturgeon Memorial award - its third shortlisting, following its appearance on the Hugo and Locus lists. Good luck to all the authors. I've also just received my contributor copies of the Subterranean Press edition of "Troika" (very slightly tweaked compared to the original version in Godlike Machines), and it's a lovely looking item. "Cryo-arithmetic engines are a specific class of quantum computer discovered by the Conjoiners. When certain algorithms are executed on processors of this architecture, it leads to a local violation of the Second law of thermodynamics: the computer gets colder instead of hotter. Consequently, cryo-arithmetic engines have massive industrial (as opposed to computational) ramifications for Conjoiner manufacturing; such engines abound in Conjoiner asteroid factories, where their calculations can drain away the heat of starship construction." In the interests of fairness, though, I'd have to point to Greg Bear's excellent novella "Heads" as an earlier example of SF dealing with computation and weird thermodynamics. The video is equally marvellous and bizarre. I have the sense that it's referencing something, anyone know what? Some half-remembered East European childrens TV series, perhaps? In 2009 I wrote and narrated a very short story for the Guardian. You can now read Scales at http://www.lightspeedmagazine.com/. Thank you to John Joseph Adams for taking the story, and to Erin for the interview which accompanies the piece. Talking of science fiction and space travel ... who wouldn't want to go to Mars? Or even Marz? Actually, it's about a sweet shop, not the planet, but this is a wonderful track from John Grant's new album "The Queen of Denmark", which is itself utterly splendid. This strange and beautiful song has been picking up some airplay in the UK but it's always worth hearing, and I think this is the official video for it. Rather fantastically, it seems to have been filmed around Cardiff.